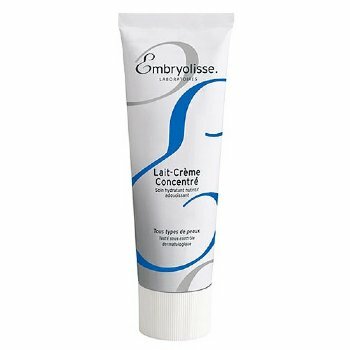 There is no better place to start than with one of my basics I use to prep most the skin I work on for print and events: Embryolisse Lait-Creme Concentre also known as 24-hour miracle cream. Embyolisse has always been one of those products, for me, that everyone else had and sounded intimidating enough for me NOT to try. I’m a simple girl. Give me some Cetaphil or something that says moisturizer on it and I’ll be A-Ok. 🙂 Well, when I noticed this moisturizer in artist’s kits backstage (at- every- show- I -ever- worked- on!) I started to wonder if maybe I wasn’t giving it enough of a chance. I decided to pick some up at The Powder Group’s NY Makeup Show and see what all the fuss was about.